Crowson: What's Uglier Than Rat Fink? I do love Rat Fink. Rat Fink always cheers me up. To those of you sadly unfamiliar with this cartoon character, Rat Fink is a hairy, grinning rat, who stands upright and wears a red sleeveless shirt emblazoned with a gigantic “R. F.” Flies buzz around his head and his eyes bulge outward from their black sockets with lovingly detailed blood veins adorning their whites. 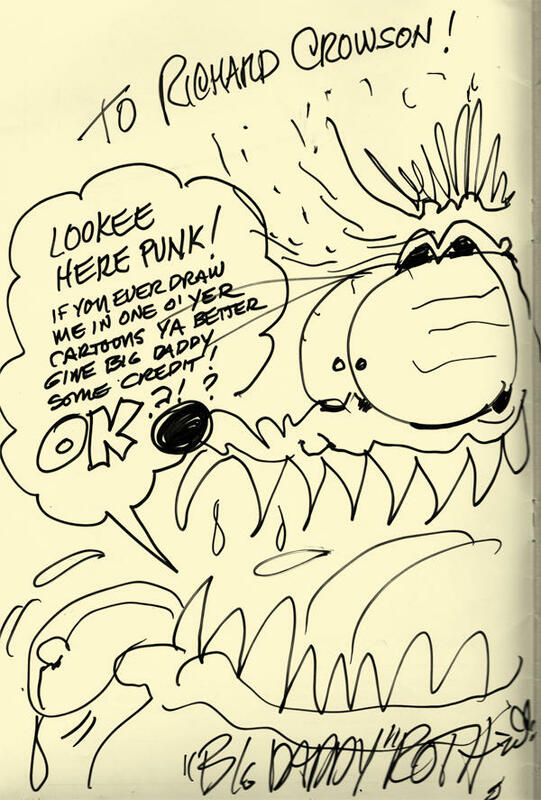 Ed “Big Daddy” Roth first drew Rat Fink in the late 1950s. Roth sold airbrushed t-shirts on which he cartooned hot rods with gigantic-headed monsters driving them called “Weird-o’s.” He conceived Rat Fink as a counter to Disney’s very wholesome Mickey Mouse. To me and probably countless other boomer kids in the early '60s, Rat Fink was the first anti-heroic, deliberately rebellious cartoon character, gleefully “in the face” of the sweetly wholesome status quo. I learned to draw him in my fourth grade classroom and proudly sketched him on my notebook covers. Rat Fink never fails to cheer me. I learned about the joy of tweaking the powers that be with pen and ink from the grotesque form of Rat Fink. In the late 1990s, I met Big Daddy Roth at the Starbird Rod and Custom Show at Century II. I thanked him for the inspiration that Rat Fink gave me to take up pen and ink against the status quo. My problem today is: Politics has gotten uglier than Rat Fink. The status quo has out-Rat Finked the Rat Fink himself!